Mission: The Monterey History and Art Association sharing the histories and the diverse legacies of people, stories, and places that continue to shape Monterey. 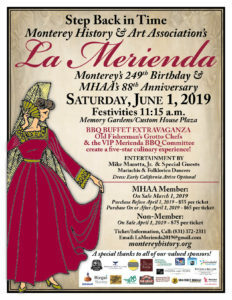 From its founding in 1931, the Monterey History & Art Association’s primary mission has been to help preserve the irreplaceable reminders of Monterey’s colorful heritage. 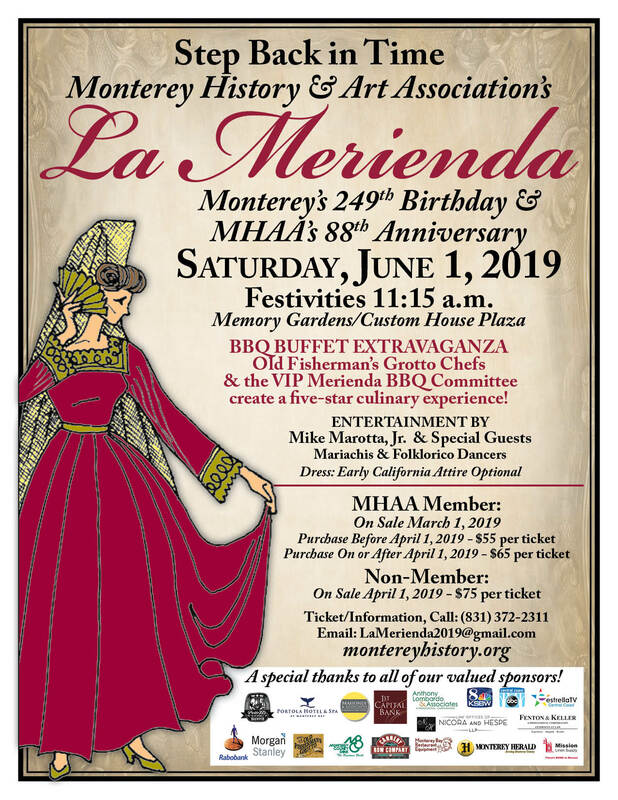 Over the past seven decades, the Association has worked closely with the City of Monterey, the California Department of Parks and Recreation, the National Trust for Historic Preservation, and other agencies. As a result, more old adobes have been preserved and restored in Monterey than anywhere else in California. 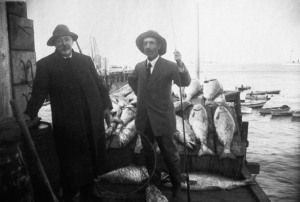 The Association has been a guiding force in Monterey’s vital historic stewardship. The guarding of Monterey’s precious community assets and the preservation and presentation of its historical heritage for future enjoyment has been made possible by citizens who care and give generously of their time and resources. Colonel Roger S. Fitch, first President and distinguished holder of that office for 17 years, thus expressed — a little over-enthusiastically, perhaps, but nonetheless sincerely — the motivation and prime objective of the founding members of the Monterey History and Art Association. Mrs. Powers’ committee also presented a list of 20 historic sites meriting permanent markers During the following year the Association, in cooperation with the Monterey Chamber of Commerce, listed and registered with the Department of Natural Resources, Monterey’s most important landmarks, leading to the development of the Path of History described elsewhere in this book. In 1934, the Association cooperated with the State Department of Parks to preserve the first French Consulate, which was moved to El Estero Park and now serves as the Visitor Center. Much later, the establishment of the Allen Knight Maritime Museum gave recognition to Monterey’s whaling operations of the early days, its importance as the principal port on the west coast until the mid-19th century, and its fishing industry, which continues to add revenue and color to the waterfront scene. From its inception, the Association has operated on a broad scale, bringing together men and women of sound knowledge in many fields, intellect, talent, imagination and enthusiasm. Their contributions of time, effort and financial aid — all required in generous measure — have accounted in great part for what remains in the portrayal of Monterey’s history today. To preserve Monterey’s unique heritage, the same drive and dedication will be required from those leaders who rise to meet today’s challenges.